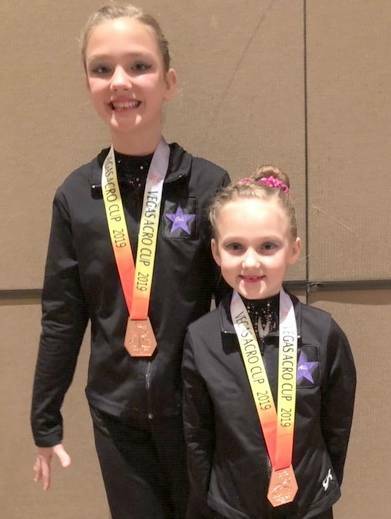 LAS VEGAS – The Aerial’s gymnastics team brought home a pair of bronze medals from The Vegas Acro Cup, an International Gymnastics Federation World Cup event for acrobatic gymnastics. 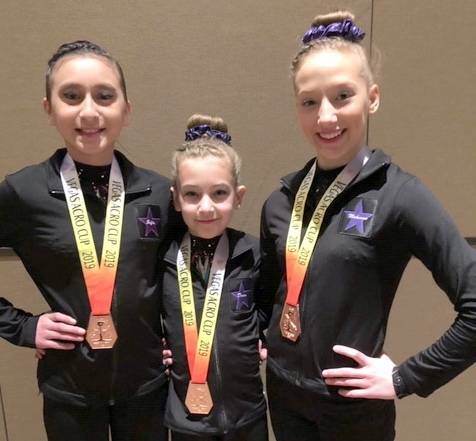 The Level 7 Trio of Makenna Tolliver, Sofia Castillo and Dana Holloway where third as was the Level 7 Pair of Cali Layne and Alli Knecht. In all 24 local athletes competed in Las Vegas. There were 13 of the 24 who placed in the top six of their respective divisions. 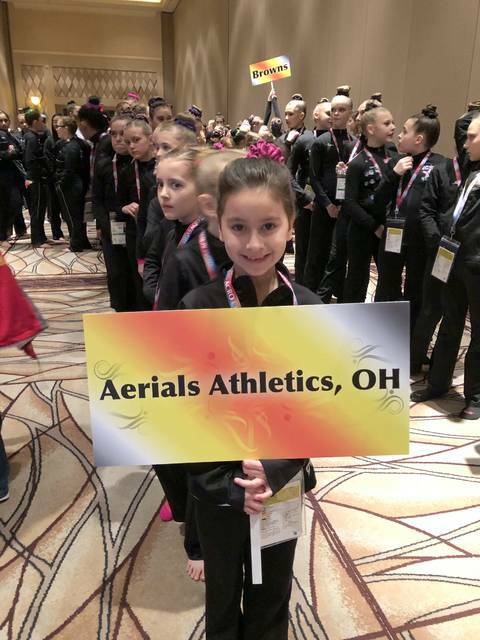 “We knew this would be a large and tough competition,” said Aerial’s coach Angie Layne. “We were thrilled to have all 24 athletes ‘hit’ their routines. 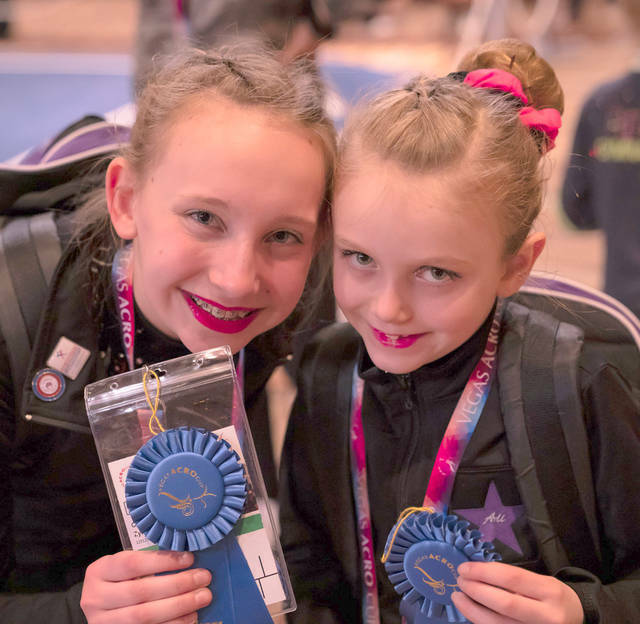 Sixteen routines with no missed skills … that’s all you can ask of them. 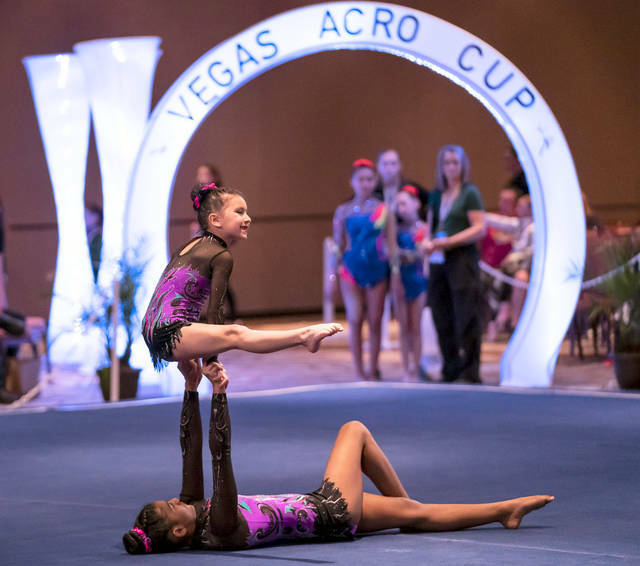 This international event is the second of four World Cup events in the FIG’s 2019 Acro World Cup series. 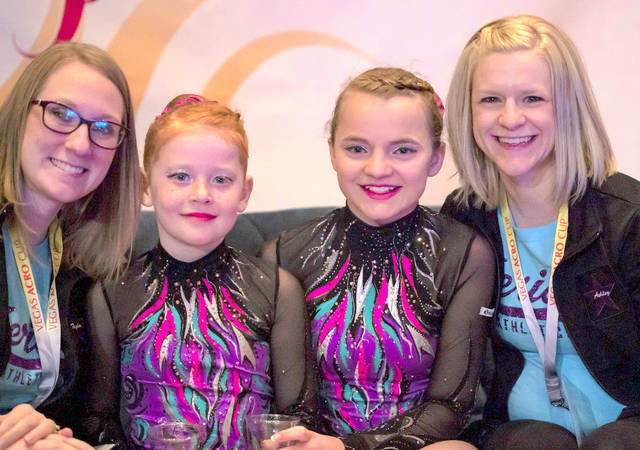 Participating gymnasts can earn World Cup points based on their performances that count toward the coveted Acrobatics Gymnastics World Cup Series champion, which will be determined this fall at the conclusion of the series. Each pair or group performed three total routines: balance, dynamic and combined. The international invitational division has competition in 10 competitive levels, and the field of more than 1,100 competed. The levels are Junior Olympic Levels 6-10; age-groups 11-16 and 12-18; junior; and senior. 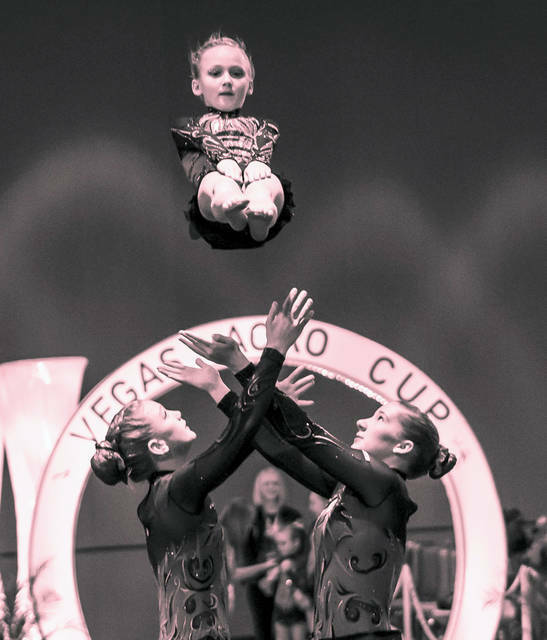 Acrobatic gymnastics combines the beauty of dance with the strength and agility of acrobatics. Routines are choreographed to music and consist of dance, tumbling, and partner skills. At the elite level, each pair or group performs a balance, dynamic and combined routine. 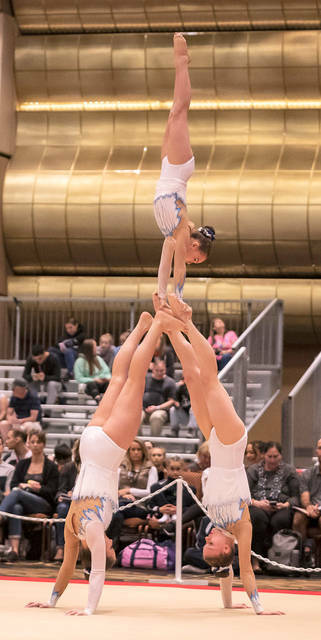 Pyramids and partner holds characterize the balance routine, while synchronized tumbling and intricate flight elements define the dynamic exercise. The acrobatic gymnastics events are: men’s pair, mixed pair, women’s pair, men’s group and women’s group. 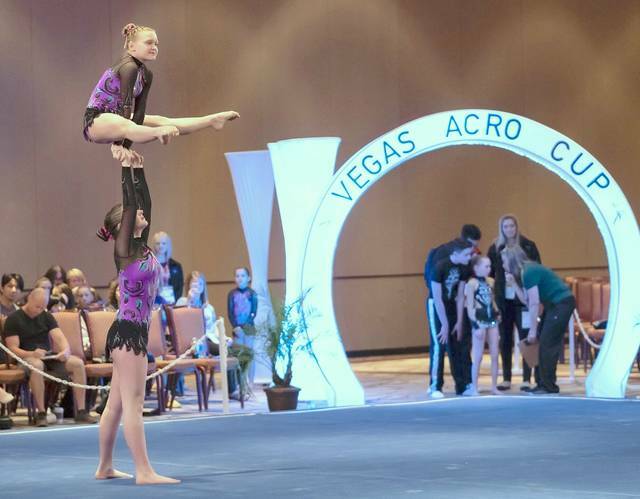 An acrobatic gymnastics pair consists of a base and a top. A women’s group is comprised of three athletes – a base, middle and top partner.